We are now offering Yoga for strength, flexibility and relaxation for adults. All levels are welcome. A great and fun way to get in shape. This class is taught by Kristyn Fedich, one of our Music Together mothers who is a certified instructor. Classes are offered at our Sparta Studio on Wednesday nights at 7:15. There is a $15.00 drop in fee per class. First class will be Wednesday, February 13th. For information call the office at 973-400-8719. We are very excited to Welcome Mr. Victor to our Song A Song NJ family! He is an amazing guitar teacher and we feel so lucky to have him! If interested in lessons please contact the office 973-400-8719.Victor Fiore is a Music Instructor specializing in Guitar Lessons. He has been teaching Stringed Instruments to students of all ages for the past 24 years. All children are musical. Come join us and watch you child grow and thrive with our program of song, dance, instrument play, movement and plain fun! If classes are cancelled due to inclement weather, holiday or teacher illness, you will be notified by at least one of 3 ways.The best way is a message that you will get on your cell phone immediately if you are signed up with REMIND.COM (To sign up you need to text to 81010 then text this message: @singas you will be given further instructions to put the APP on your phone so you can receive emergency messages from us. The other two ways are through our facebook site: Sing a Song NJ. (remember to like us on Facebook) or if we have time is with an email directly to your email address. If we have to cancel class we will add the class to the end of the semester so you will not miss your 9 weeks. Welcome to Sing A Song NJ! Serving Sparta and Hampton NJ. Call Today for a free trial class! Serving Sussex County New Jersey and surrounding areas for over 30 years, our Music Together® classes build on your child's natural enthusiasm for music and movement. 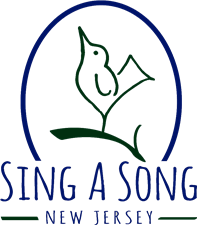 At Sing a Song, NJ we believe music is an essential part of a child's development. Children are born with the ability to sing on perfect pitch and move in perfect time to music.Between the ages of birth to 5 the live music experiences children have will determine how easily music and learning will be for that child. Music Together classes give families the opportunity to have an interactive musical experience that fosters brain development and the pure joy and fun of making music together and build lasting friendships. Following the high standards set by our award winning Music Together program and teachers, we also provide families with high quality acting, singing, dancing, piano and guitar lessons. These classes are for children and the adults who love them: Mommy & Me, Daddy & Me, Grandma or Grandpa & Me or my Nanny & Me!